Andrew Grumbridge and Vincent Raison founded Deserter in 2014 – an online guide to messing about summed up by their motto, Shirk, rest & play. It quickly became essential reading for thousands of South Londoners looking to get more out of life by doing less. Soon, along with its various social media channels, Deserter had its own beer, Deserter IPA, created with Southey Brewing, Penge. In 2018, they published their unique portraits of life below the river in Today South London, Tomorrow South London. 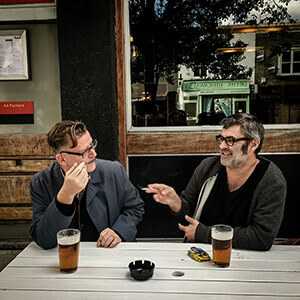 These born and bred South Londoners, under their noms de plume, Dulwich Raider and Dirty South, record offbeat days out and half-remembered urban adventures featuring pubs, cemeteries, galleries, hospitals and pubs again.